We visited Temple Square in Salt Lake City, Utah last spring when we were looking for houses. No matter the time of year, there is always something beautiful happening on the temple grounds. That time was no exception. I was pretty excited when my mother-in-law brought me a copy of this book! I was ready for all the wisdom from some top-notch, award-winning landscape artists. 4 stars: Despite our overall goals being different, I learned some things. 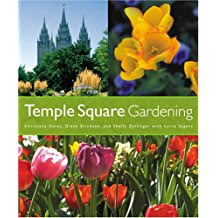 This book starts off with a short history of Gardening on Temple Square, then goes into chapters on Gardening Basics, Planning a Garden, and Designing a Garden. After that, there are chapters on some of the main plants used, Tricks of the Trade, and Managing Pests and Diseases. Finally, there are extensive lists of favorite plants. Bright, color photos fill the book, illustrating the various concepts. The lists of favorites at the end also features color photographs of each specimen. It was interesting learning about the gardening philosophy for Temple Square's gorgeous garden designs. I mentioned our goals being different. The biggest difference is that their gardens are designed to look show-stopping every season, every month of the year. So for instance, they dig up all the spring-blooming bulbs every year after the flowers have faded, so that the beds aren't filled with dying foliage for half the summer. That's a lot of work (and opposite of my approach--I want those bulbs to perennialize!)! It also means they pack entire beds full of spring bulbs, where I add patches here and there throughout my beds. What I found most useful was in the section on design. They talk about 4 design principles they use to create the gardens on Temple Square: skeleton, tendon, flesh, and sparkle. This is something I want to try implementing in some of my home flowerbeds. So the skeleton would be the dominant plants--whether in color, height, form or texture. They choose which form of dominance they want to emphasize, then draw a curve in the soil. The "skeletal flowers" go along the curve in groups of 3, forming triangles in relation to each other. Next are the "tendons," flowers that connect and blend with the skeleton plants. So they might have a lighter shade of color, or similarities in form, etc. These flowers are placed along the curve, also in groups of 3, their triangles interlocking with those of the dominant plants. Then you place the "flesh" plants. These are plants with less dominant flowers or shapes, and are placed throughout the bed, filling in all around the curved shape. They estimated 60-80% of all the plants in a given bed would be the flesh plants. Nothing here that would stand out on its own, but all that look good together and soften hard edges. Finally, you add the "sparkle" plants. These are flowers that have high levels of contrast to the surrounding color scheme--usually in shades of orange, white, or yellow. Just a few of these are planted in odd-numbered groups here and there to add a splash of vivid color. A useful addition to my library of gardening books.